The season two premier of Netflix’s hit show, Stranger Things, is less than two weeks away. Since we’re big fans here at LMK, we’ve been preparing a lot like you have: by re-watching episodes, obsessing over the new trailer, and daydreaming about what season two will hold. 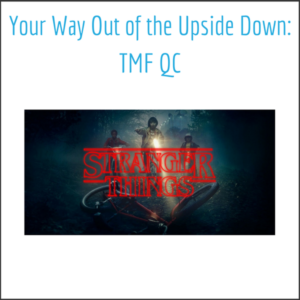 But at LMK, we aren’t just your normal fans … when we watch Stranger Things, we can’t help but see parallels to another topic we are very excited about… TMF QC. For those of you who are not familiar with the story, we will summarize it here (and keep the spoilers to a minimum). Stranger Things is set in the fictional humdrum town of Hawkins, Indiana in the mid-1980s. The show, so far, hinges on the mysterious disappearance of twelve-year-old Will Byers, who, in the opening scene of the show, is abducted by a shadowy monster as he bikes through the woods on his way home. After learning of his disappearance, Will’s best friends set out to look for him in the woods where his bike is discovered, but instead of finding Will, they stumble upon an unusually silent girl in a hospital gown sporting a shaved head. After befriending this strange girl, who they learn is named Eleven, they are astonished when she begins to display frightening psychic and telekinetic powers. As the series progresses and the monster claims more victims, the true nature of Eleven’s powers are revealed, and a deep-rooted conspiracy involving the town’s mysterious government research facility unfolds. You’ll have to watch to learn more! Of all the fantastical concepts in Stranger Things, the most central to the plot is the existence of an alternate universe just beyond our fingertips. This alternate universe, named the Upside Down by Will’s friends, is a cold, foggy, and desolate version of the human world. It also happens to be the habitat of the monster who abducted Will and who is continuing to terrorize the town of Hawkins. We at LMK, however, also think the Upside Down is an apt allegory for an unhealthy TMF. To us, the Upside Down is the perfect embodiment of the gap between the disorganized TMF you’re struggling to tame and a pristine inspection ready TMF. But don’t despair! There is a way to stay firmly rooted in the human universe: by employing TMF Quality Control (QC). But what is TMF QC? It is best to answer that question by saying what TMF QC isn’t. TMF QC is not a spreadsheet in your shared drive or an inventory of received documents. TMF QC is not the audit you’ve been dreading. Instead, TMF QC is the harmonious interplay of structure and function. TMF QC means proactively setting standards of quality, and utilizing systems and tools to continually verify the TMF against these standards. While completing these steps, the study team may identify the need for tools to manage these workflows—sometimes as simple as Excel trackers or as powerful as an Enterprise-sized system. The key is to ensure the tools employed on the TMF are appropriate for the needs of the project team. Employing the wrong tool for the job can create undue distraction and extra work that doesn’t bring the study team any closer to meeting their goals. All of the steps above represent important actions you can take to establish the foundation of a healthy TMF, but together they are only the start of a complete TMF QC system. Quality Control is any activity taken to ‘close the gap’ between expectation and reality. Through continuous verification that the expectations for your study (whether SOPs or regulatory requirements), issues can be addressed before they spiral out of control. Overtime, as the review cycle is repeated, the health of your TMF steadily improves. TMF QC also improves your mental health by preventing last-minute surprises. Without TMF QC, your study’s TMF may begin in idyllic Hawkins, Indiana, but suddenly find itself located in the Upside Down. Fortunately for all of us, TMF QC is a reliable gateway back to the familiar human world. Check back next week when we discuss how to defeat the Demogorgon through an inspection-ready TMF.